Hi does anyone know how many calories would be in the breakfast bread?? I’m just popping in from the 5:2 diet and would suggest that, for any calorie values, download the app My Fitness Pal, go to the recipes, put in the ingredients and it will calculate it for you. Hope that helps! 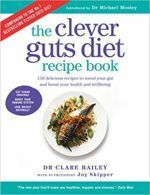 A shame the clever guts diet did not have the calorie content of the recipes, for people trying to heal their gut and lose weight. Bellaboo: I don’t think Dr Mosley intends us to do both at once. But rather give our guts/ microbiomes all the nutrients they need to repair, recover, regenerate. By their very natures, elimination diets AND calorie controlled diets are restrictive. By controling portion size and number (official and book recommendations), balancing food groups, listening to your hunger signals you should not overeat. Bellaboo: the CG diet advocates at least seven servings each day of brightly coloured non starchy vegetables and lower sugar fruits. These are naturally low calorie. Add to that eliminating or heavily reducing foods and drinks that contribute most to the excess calories in the standard UK/ US diet (alcohol, processed starches, added sugars, ‘bad’ fats). Then increasing but measuring ‘good’ fats (olive oil/ nuts/ seeds/ oily fish) and filling prebiotic fibre and we should struggle to overeat.